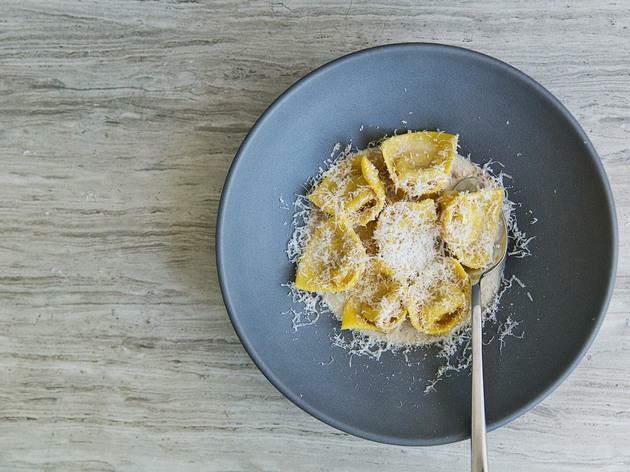 There are a few things about Alimento, a new Italian spot in Silver Lake from Sotto's Zach Pollack, that have the potential to turn off the most amiable of diners. There is the size (tiny) and the corresponding waiting time (lenthy, even with a reservation). There is the extra charge for water (yes, water. More on that below). There is the noise level, which skews closer to a raucous cacophony than a tolerable din, and prompted myself and some friends on a recent visit to clarify before we ordered that the food had better be worth it if we were going to sit through this level of noise. It is. It is worth it from beginning to end, thanks to Pollack's creative blend of techniques and influences that leave you expecting one thing and tasting something entirely different. 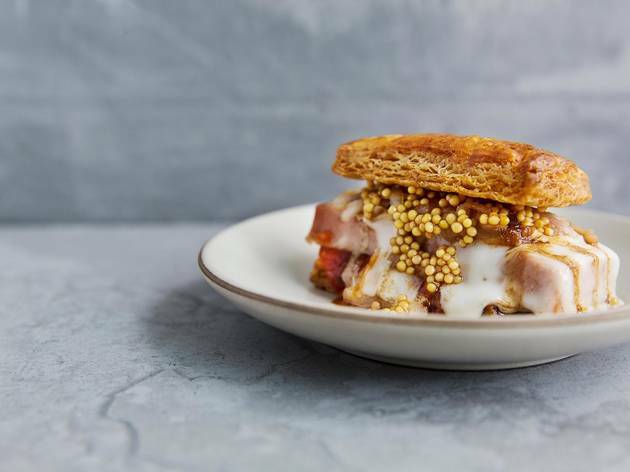 The pig in a blanket is not just an elevated version of the classic elementary school snack food but a completely different concept altogether. 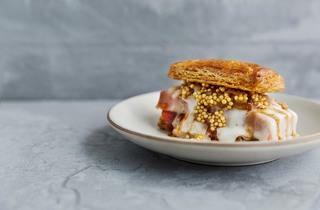 Puffy spelt pastry bookends a thick slab of mortadella, fatty and rich and piled high with stringy brovada (pickled turnips). A considerable slice of crescenza cheese is draped over the pork, so yeah, you could call this a ham and cheese sandwich, except if that was the case my childhood would have been filled with better school lunches. A cracked emmer salad was equally delightful, with paper thin radishes and gobs of pecorino scattered around a bowl of fluffy farro. Following any small plates you may share are the selection of pastas (good for one person, maybe two if you're trying a couple) or platters (which seem to be capable of feeding an army). 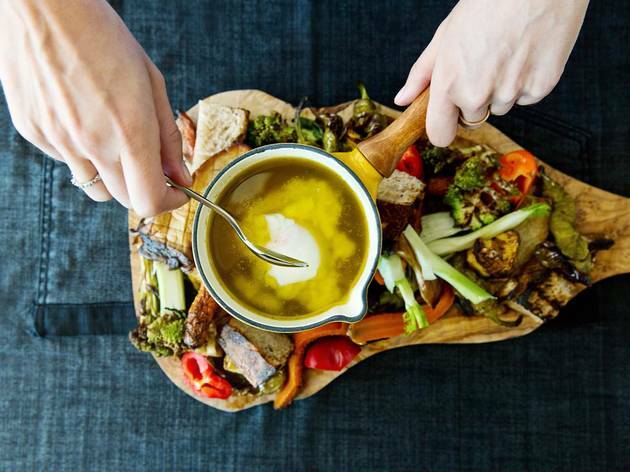 The bagna caoda DOP, a traditional Italian dipping sauce, features a simmering pot filled with broth made from anchovy paste, garlic, oil and butter, and is surrounded by raw vegetables, grilled bread and a single egg. It looks like something that might belong at a King Arthur banquet, and was the only dish that proved to be more trouble than it was worth. "You crack the egg in the broth when the liquid gets close enough to the flame," explained our waiter—but doesn't that mean we'd be adding a new element to a mostly eaten sauce? It was too bizarre, too cumbersome (the paste kept sliding off the veggies) to thoroughly enjoy. 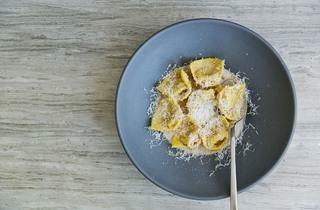 Better to stick to the pastas, which is where Pollack's creative flair really kicks in. 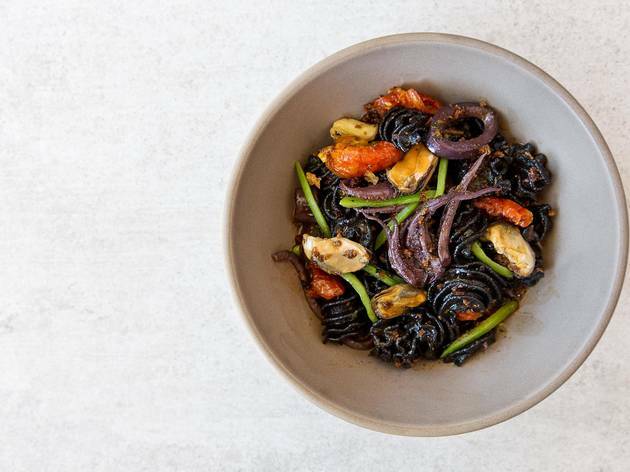 A squid ink radiatori is filled with plump mussels and squid, but also pods of peas and a sprinkling of breadcrumbs that mimick the gritty sand you might find in a mussel shell (though far more enjoyable). A rye tagliatelle, albeit on the salty side, uses thyme and hints of lavender to bring out the accompanying veal ragu's earthy tones. And then there's the tortellini. If there is one dish to come here for, it is the tortellini in brodo, a fascinating hybrid of the classic pasta and Chinese soup dumplings. There the tortellini sits, looking like a regular ol' bowl of pasta in a cream sauce, until you bite into it and the salty, clear broth of the soup explodes in your mouth—an outstanding mix of textures. We were in heaven, and pulled our waiter aside to grill him on how chef Pollack makes this dish. "I don't know, I'm not the chef," he said, understandably. Maybe it doesn't need too much explaining, this inside-out dish, but we couldn't stop thinking about it until the rice pudding came along, a cute little jar of rice in condensed milk with some sour cherries and a sprinkling of nuts mixed in. "This is the way rice pudding should taste," I said, going after the creamy dessert by the spoonful. Then again, that could be said about most of the dishes at Alimento. What to Eat: The pig in a blanket ($11). The cracked emmer salad ($12). The tortellini in brodo ($14). 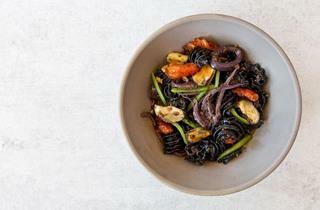 The squid ink radiatori ($16). The rice pudding ($6). 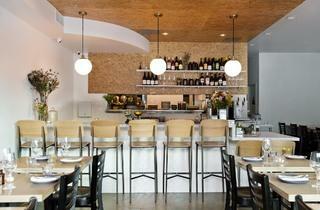 What to Drink: The wine list at Alimento is concise but well-crafted, featuring mostly Italian varietals from lesser-known vineyards. Glasses range from $8 to $18 (that would be for a Scarbolo 2011 Pinot Grigio Ramato), and cover whites, reds and sparklings. Where to Sit: Alimento is small, seating about 40 people (despite our reservation, we still had to wait close to 30 minutes). There's a small chef's counter, but sitting there won't cut down on how outrageously loud the restaurant gets. So accept whichever table your hostess gives you and settle in for a dinner that requires a little shouting. Conversation Piece: Yeah, so about that water charge. 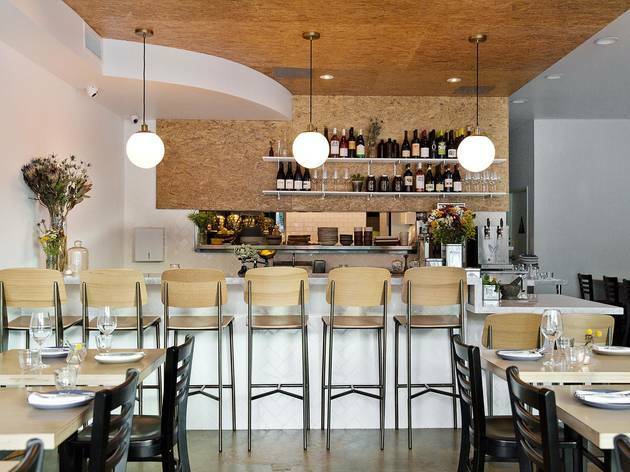 For $1.50 per person, diners get unlimited (aw shucks, you shouldn't have) filtered or sparkling water, with 50 percent of each sale donated to the Silver Lake Reservoir Conservancy. When asked why we couldn't order tap water, our waiter replied, "We don't cook with unfiltered water, so why would we give it to you to drink?" Some of you will accept this answer, others will not. Either way, you'll still have to pay for the water. I'd suggest getting on board. A little pricy, but amazing food. You must try the Ribeye steak! You could order anything (or everything) on this menu and it would all be great. But the dish that stands out the most—the one everyone has probably already heard all about, with good reason—is the tortellini en brodo. If you go to Alimento and don't order it, you're crazy. That being said, if it's just not your thing, the cracked farro salad, braised lettuce bruschetta and radiatori are also great bets.